Maggie came under the care of the Newfoundland Club of NSW as a rehome due to her family realising that they could no longer give her the care she needed. The club hopes that Maggie will soon enjoy her 5th Birthday with her furever family. The one thing I would like to acknowledge on behalf of the club is that her previous family did right for her. As soon as they realised the limitations of the care they could give versus the care she needed, they did not advertise her on Gumtree or free to a good home on any other social media page, but contacted the club. Rehomes or rescues all deserve to have a family with a home that is unconditional and this is the home that a breeder should always aim for but occasionally, for whatever reason, the family can no longer look after their Newfoundland and that truly is one reason why we should have specific clubs. Most registered breeders will insist that if a family finds themselves in a situation like Maggie’s family to first and foremost contact them to see if they can help e.g. they may know of people who are looking for a mature dog like Maggie rather than a puppy. However many dogs do end up on social media pages etc. and their family never really knows where they end up or what has happened to them - let alone finding out if the new family really knows how to look after a fully grown Newfoundland? 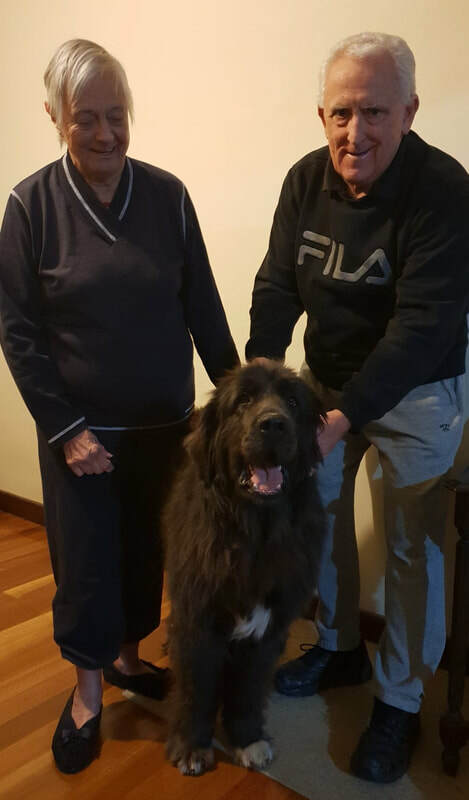 Not knowing where to find a suitable home, Maggie’s family looked online and found an established breeder who also was a previous committee member and is now a life member of the Newfoundland Club of NSW. Her first response was to contact the president Sheila Roberts – thanks to Frances Wilson for helping with this! As the Secretary of the Club I made contact with the family to find out where Maggie was and what exactly we could offer. Maggie is a playful girl who loves her toys and adores spending time with her human family. This picture was taken by her first family and it really shows what a good girl she is and how much she enjoys playing with a football – and what a joy it is when she plays – you can see how agile she is. Maggie is a very gentle natured girl who accepted me very freely and was only too happy to jump into the back of the van and travel all the way to meet Denis and Lindy Burke. ​Her coat needed some work so Denis and Lindy Burke booked her in and offered their expert skills developed over the years of caring for Newfoundlands - their own beloved dogs as well as a few others along the way. Maggie has been staying and enjoying the comforts offered by Denis & Lindy. I hope you will join me in agreeing that they have done a splendid job of caring for Maggie and her coat. Her diet did not agree with her so she now enjoys mince, fruit, veggies and yoghurt along with a new dry kibble which was given freely by Denis and Lindy. A trip to the vet updated her vaccinations and ensured that she was heartworm free. She did have an ear infection and a hotspot – both treated by the vet and she is responding well. The Newfoundland Club of NSW has devoted members who annually donate money to the group and its rescue which allows the club to support and rehome dogs like Maggie or dogs that are found wandering the streets or that find themselves surrendered to the pound. Maggie already has a new family waiting for her but the club is always looking for members who know of families willing to offer a home to a rehomed or rescued Newfoundland, or who are prepared to pick up dogs on behalf of the club or even foster a dog until they are ready to go to their new family. ​The Club has had no rescue or rehomes for over 2 years now but Maggie is the second Newfoundland in the last couple of months so we really don’t know when where or how these dogs will get to us but they all deserve a ‘Furever Home’. I hope you will enjoy the pictures that Dennis & Lindy have taken of Maggie – she is such a sweet girl and simply just adorable. ​I know her new family, found with the help of Sue Berry in QLD, will love her dearly but it was still so emotional going back and seeing her getting ready for the move. Of course the club will continue to follow Maggie on her journey and like all the Newfoundlands that come into the care of the club we will take them back should the need arise. The club would also like to acknowledge Dogs Movers for providing all rescue groups with reduced rate for transportation as they know how important it is to get all rescue / rehomed dogs to the right family. Dog Movers took Maggie to her new family. The really nice gentleman called Trevor cares for all the dogs on the way so Maggie wanted to make sure we thanked them for taking her to her new family. Database of Volunteers: We are trying to establish a database of volunteers, so if you are interested in helping the Newfoundland Rescue with the logistics involved in rehoming, please contact Club Secretary Sue Frew. Mobile: 0439523040 This could include picking up a dog, being a temporary foster or even a permanent forever home.